Awards are raining on actress Kiron Kher, wife of leading film personality and the head of India's film censor board Anupam Kher. When Kiron got the national award for best actress for her role in internationally-acclaimed Bengali director Rituparno Ghosh's film Bariwali three years ago, not many could think that recognition for her would come so quickly again for someone who embarked on celluloid career so late in her life. Yet, the reality is that in the space of three months beginning this August, Kiron was adjudged the best actress at two prestigious international film festivals in Locarno, Switzerland, and Cape Town in South Africa this time for her performance in lead role in a multi-national production film Khamosh Pani (Silent Waters) by Pakistani debutant director Sabiha Sumar. Winning the award for Bariwali was undoubtedly quite an achievement for Kiron, a Sikh who had migrated from Pakistan part of Punjab province, who spent more than a year learning Bengali so that she can dub her dialogues herself for the film. That apart, in Bariwali, Kiron comes out with flying colour portraying the difficult role of a woman in a closed world opening up to emotions and unfulfilled relationship with a man. Bariwali is the story of a middle-aged woman Bonolata who lives alone in a sprawling house with two servants after the man she was to marry died of snakebite two days before the wedding. Bonolata's prosaic life sparks up with the arrival of a film shooting unit whose director (the role played by Bengali actor Chianjit Chakravarty) who likes to use her house as a locale. She agrees to let her house to be used for that purpose and in the process a relationship develops between her and the director. The film ends on a note of failure for Bonolata when she realizes that the director only wanted to use her emotionally as well as and her house for the shooting. Kher's portrayal of the rise and ebb of emotions of a woman in solitude and emotional vulnerability at the sudden exposure to a man has drawn unanimous praise from critics. The accolade for the role in Bariwali must have been doubly sweet for Kiron as it also marked the debut of her husband as a producer. It won the Network for the Promotion of Asian Cinema (NETPAC) award for the best Asian Cinema in Berlin festival in February 2000. Three years down the line and international awards came to Kiron in Locarno Festival in August this year when she shared the Silver Leopard for best actress for the role in Khamosh Pani. In fact, she shared the award with Romanian Diana Dumbrava. The film won the Golden Leopard for being adjudged as the best feature film. Khamosh Pani is the story of an Indian Sikh woman Veero (played by Kiron) who is abducted and taken to Pakistan during the Partition of the sub-continent, gets married to her kidnapper, converts to Ayesha and bears him a son Saleem. Eighteen years down the line, under Gen Zia ul Haq's Pakistan, a widowed Ayesha finds her son change to a fundamentalist. The mother-son relationship sours as Saleem discovers her origin and former religion. Kiron says she agreed to do the role in Khamosh Pani as she was impressed with the story. One reason for that, says the actress, was she could immediately relate herself to Ayesha being a Sikh. Secondly, the character of Ayesha was drawn from what I had heard from my family-members of the tragedy of the Partition, says Kiron. That apart, the treatment of the subject also made the actress excited about the role in the film, says she. 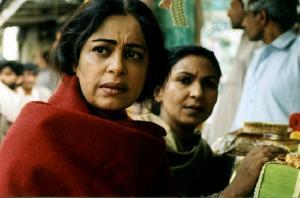 Director Sabiha Sumar says to choose the story was that although the subject of Partition has come up in a number of films, the issue of kidnapped women and their plight has not been openly dealt with before. The film was shot in a Pakistani village when relations between India and Pakistan were in a high state of tension following the terrorist attack on Indian Parliament in December 2001. One of the co-producers of Khamosh Pani is Sabiha's husband S Santhanathan, a Sri Lankan naional and the crew for the film were drawn from Germany and France. The script of the film was written by Bombay-based Paromita Vohra. The film, premiered at the Sixth International Film Festival in Bombay recently, looks at the fall-out of religious fundamentalism and tries to show what happens when fundamentalists assume power and people do no rise up, says Santhannathan. The news of her being awarded as the best actress in Locarno was broken to Kiron when she was in London with Anupam Kher shooing for a film. The next day the couple flew to Switzerland to receive the award and was overwhelmed by the 12 minutes of standing ovation the film received there. Asked how she felt in acting in a film shot in Pakistan, Kiron says work of art knows no boundary. There should be no divide when it comes to pursuing creativity by artistes.